Now for those who do not know this movie does not include the original cast of the stand alone complex series. That was the biggest turn off in the first one, however after hearing their voices I didn't mind and in this one they seem to be better. Possibly from practice or just a better understanding of their characters. For a compilation of the season the editors did a very good job so that it flows nicely and it even includes some of the philosophical ideas that are in the series. The first one (in my opinion) did not really keep it. I have seen movies of this sort (for example X) that did not do a good job with their editing but as I said this was one of the good ones. Story wise it is the same as the season of course but it is recommended that you actually watch the season instead of this since you will get more out of it. However if you just want to get to the point with out a lot of philosophy you'll like this. 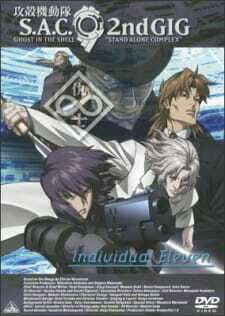 Stand Alone Complex was based on Yoshiki Sakurai’s 2001 Media Ecology dissertation “The Whereabouts of the Other in the Future of Human-Robot Interaction” (「他我を宿す条件 ～人間・ロボット間コミュニケーションの行方～」). It is about how the phenomenon of THE LAUGHING MAN — unique minds becoming individual components of a complex system acting as one collective consciousness (memes), and the phenomenon of THE TACHIKOMA — perfect machine copies of each other evolving individual differences, are the two inevitable consequences of data synchronization. The interaction between these antithetical phenomena is explored on a literary level in Stand Alone Complex, and political in 2nd GiG. Stand Alone Complex is the most cerebral anything anywhere, and it has prophesied most contemporary Internet phenomena such as Anonymous and Asange with perfect precision several years ahead. Should I watch this recap?